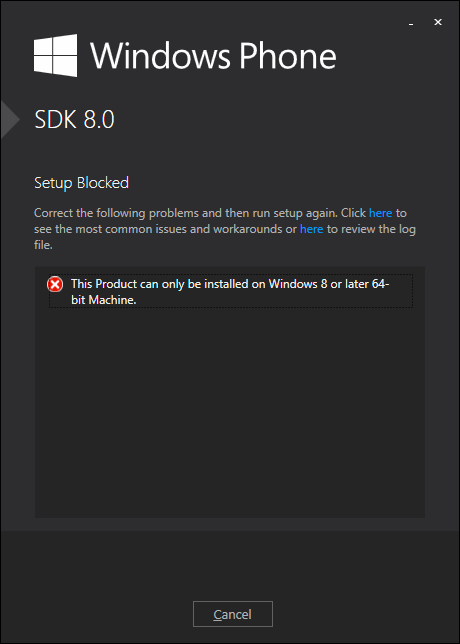 I have been trying to install the Windows Phone 8 SDK on a Windows 8 (x86) machine. But to no avail even though I read somewhere on the site that it will install but I will not be able to run the emulator. Is Microsoft serious that Win Phone 8 apps can only be developed on 64-bit machines? Not the answer you're looking for? Browse other questions tagged windows-8 windows-phone-8 windows-phone-8-sdk or ask your own question. Can we install a Windows Phone 7 SDK developed app on Windows Phone 8? How to deploy Apps in Windows Phone 8 Emulator for testing without having vs2012 installed in windows 8 machine? Can i install Windows Phone SDK 8.0 on Windows 8 PRO 32 bit computer? Can we develop Windows Phone 8 app on Windows 7 machine?